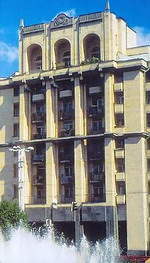 Kozatsky Hotel is situated right in the centre of Ukrainian capital - on the Independence Square. All well-known places of interest of the city - Opera and Ballet House, St. Sofia's Cathedral, St. Michael's Golden-domed Cathedral, the Golden Gates, Kyiv-Pechersk Lavra, Museum of Ukrainian Fine Art, the Cabinet of Ministers and House of Parliament - are situated in immediate proximity to the hotel. The hotel offers suites, double and single rooms. All rooms have own bathroom. The suite consists of a bed-room, a living-room and a bath-room. The room is equipped with the direct access to the telephone network, a TV set with cable television and a refrigerator. Lux review. Single and double rooms are equipped with a city phone line, a TV set and a refrigerator in the room. Three pax can be accommodated in suite.